As you know by now, I’m a big fan of compost which I believe is the single best soil amendment you can add to any lawn or garden. What you may not know is that I’m also an efficiency nut. I’m always looking for the most productive way to take on any task. So it’s only natural that I find one of the easiest ways to clean up the kitchen is to toss those food scraps from salads, vegetables and fruits right into the compost pile. So much from the kitchen and even other parts of the house are perfect ingredients for making great compost and make cleaning up so much for productive and fun. Besides making great soil right at home, I certainly try to do my part to reduce the pressure on our community landfill. In fact, I’ve indoctrinated my family into this composting-recycling obsessive world in which I live. But I may have gone a little too far with it. Now I have them afraid to throw anything away. I must admit, my fervor has resulted in a plethora of recyclables at my house. The best part is anything that can be composted is composted. As part of our system, we now have a dedicated cabinet in the kitchen that houses two bins. One is for the daily compost and the other for recyclables. I thought it would be a tough sell to get my wife to go along with the ongoing storage of food waste inside the house. As it turns out, the biggest challenge is my remembering to take it out at the end of each day. After all, that was our deal. This learning curve and total acceptance by my family to the system has resulted in my having to fish out some pretty crazy items that just didn’t work in the compost bin. That’s alright though. I’d rather fish them out than have them thrown out. There’s no chance to compost then. So just what can and can’t go into the compost bin? From inside the house, just about anything that once came from a living source can be composted. 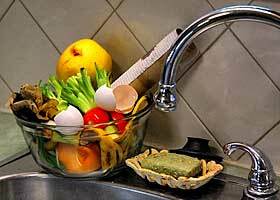 From the kitchen add all fruit and vegetable scraps, coffee grounds and filters, paper towels and the roll, napkins, oatmeal, banana peels, eggshells and tea bags. You’ll find more items. From around the house, vacuum cleaner bags and contents, dryer lint, cardboard rolls, clean paper (shredded is best), newspaper, cotton and wool rags, hair and fur and house plants. As with everything in life, there are exceptions to the rule, including household compost. First, don’t add meat products, bones, fats, grease, oils, or dairy products to compost. They create odors that can attract pests such as rodents and flies. And don’t compost pet or human wastes. These can contain parasites, bacteria, germs, pathogens and viruses that are harmful to humans. I must admit, now that the family is onboard, our household composting machine is running smoothly. It took a little work at first but now it’s a healthy habit that I doubt we’ll ever break…nor should we. Besides the good we’re doing for the environment and our garden, my children are learning important lessons on stewardship. And when they get to eat fresh vegetables from the garden, nourished by the compost they helped make, it really is an easy sell. So Joe, what do you think about putting the fruits and veggies from the kitchen through the VitaMix BEFORE dumping into the compost? Also, my grass clippings contain a lot of moss. Can I include the grass and moss in my compost pile? My husband says I need to keep the moss out of my garden, PERIOD! What do you recommend on both questions? The great thing about a compost pile is that you shouldn’t have to do anything but put the peels and cores right into the pile. Let Mother Nature do the rest. I wouldn’t worry about the moss. Just so you are not using chemicals on your lawn. Happy gardening. Do I need to add soil or anything else to the kitchen scraps container to help the process and also to stop the flies from taking over? You don’t need to add soil to the scraps while they’re inside your house. Keep this simple. Inside the soil really isn’t going to do anything to reduce the fly population. But I’m assuming you have a place outside were you are depositing these every few days. I’ve found a stainless bowl and tight fitting lid works well to buy you a few days while you accumulate your kitchen scraps before needing to get them to the compost pile. Otherwise I don’t have a good anti-fly solution for you other than to transfer your scraps outside more frequently. There’s less of a chance for flies to lay eggs that hatch on the food scraps if you are moving your scraps no later than 3 days apart. I have been composting for years, and have tried the traditional piles as well as the tumblers/balls. But you know what I found to actually be much easier and faster? Large plastic storage bins! Discovered it by accident. I had a worm composter going, but the heat of Southern Nevada killed my little helpers the first summer :(. So I continued to use the same bins without the worms. I found it was much easier to grab my pitch fork and stir the bin up every few days than turning my composter ball. Only takes a few minutes and is easy on the back, no bending down, no lifting weight. The Ball gets really hard to roll on its base once it is loaded. With the bins I can have different stages of compost going at the same time. I just stacked them on top of each other. The size is also perfect as they hold just about as much as I can lift (when not wet). I also find it easier to “harvest” my compost from the storage bins: carry them to where I want them and dump. Done. The compost ball needs to be unloaded first, which is difficult with all those spikes inside of them. I have poked and cut myself on them several times in the past. And for the price of my compost ball, I can buy 10 – 15 bins!!! PS: Make sure to drill drainage and breathing holes into each container! Hi Adam. Your compost is ready for your garden when the original ingredients are no longer recognizable. By then, it will look more like rich, crumbly soil with an earthy, pleasant smell. Hope that helps and let me know if you need more info. Good luck. Due to deep snow I have not been able to get to the compost bins. I have stored all the waste in zipper bags since December and they are total mold. Is this more harmful than good? I think once you add the ingredients to your compost pile, the heat generated from the voracious microbes consuming the debris will neutralize any potentially harmful effects. I’m not a scientist but I can tell you I add moldy kitchen scraps all the time and have never had a problem (although not to the level you describe). Although I think you’ll be ok, if you have room in your freezer, I would place those bags of scraps as they become available to a freezer bag and store it there until time for the compost pile. That will solve your mold problem if you have the room. Also, if you have that much snow, perhaps you can store it within the snow in a accessible container until it’s time to take to the compost pile. I would like to ask a compost question. I have been composting for several years with two plastic compost bins and two leaf/grass piles. I don’t rotate as much as I should and very seldom see the fine compost that you show from your bins. What I do in the Spring and early Summer is run my compost through my chipper/shredder to make is fine enough to spread on my gardens. Is that a no no? Hi Paul. I’m not sure that’s a no-no, other than you might be wiping out your worm population. What you’re doing with the shredder should be happing on its own if the in-process compost is in balance. It sounds like the main thing you need to do to get the results you see on the show is to turn your piles more as able, while making sure the piles stay moist, like a damp sponge. Four things are needed to make compost: air, water, green waste, brown waste. That’s it. But all four are critical to the process happening to get the results you are after. And if you’re not feeding your bins or pile with food scraps, I would def. do that! Good luck Paul. Can you compost magazines and cereal boxes? I didn’t know if you have to worry about the different inks or not. Hi Pat. Everything I read today says not to worry about the dyes and inks in modern printing as they are vegetable based vs. what was used decades ago that contained heavy metals. However, I still don’t compost glossy pages such as magazines or newspaper circulars. Just playing it safe I guess plus they seem to take longer to break down in the compost from my limited experience with those items. However, I do occasionally include cereal boxes. Yet most of the time for them and all of the time for magazines and glossy color pages, they go to the recycle bin. Hi Lars. I’m afraid you may have to put your worm composting project on hold for a while. Believe it or not, there have been extensive studies on the cold tolerance of worms, and comparing that from one species to others. The bottom line is that all worms suffer the same fate if exposed to very cold temperatures for prolonged periods of time. One comprehensive study I read tested worms at room temperature vs. about 35 degrees. After about a week in the colder temps, there was 100% mortality rate. So it begs the question, then how do worms survive in climates where temperatures get colder? Well for worms that don’t burrow below the frost line (like red wigglers), they usually don’t survive, but the eggs they’ve laid do because of a protective sack around them. Next spring they hatch and the supply is restored (in nature). You could try this, knowing that you will lose your current supply. Otherwise, you may know of a large compost pile in which you can make a donation of worms. Hopefully they will seek the warmest area and potentially overwinter. Let us know what you do and how it goes. Good question Lars. Hi. I am eager to compost but I may have read too many articles. I really like the idea of tumbler which are for sale at many hardware stores. however, they say that once the decomposing has started, do not add anything else to it or it will have to “start all over” and will take additional time to use the finished product. One site suggested using 2 tumblers. Do you think I can collect the kitchen scraps in a separate container while I wait for the compost to complete and then start a new one or does the rotting of the waiting kitchen waste just melt down and spoil past a suitable compost mix? My tumbler would be in direct sunlight from about 9 am till 4pm in the summer months and just shorter hours in winter. I am central california. Any ideas on this caution. also, my regular materials would be flower garden clippings, no grass, leaves from one birch tree in fall, and I have no extra soil available to add in. I am working on a deck in the back and raised beds in the front yard, so mostly I have only kitchen and outdoor stuff that I just mentioned. thanks for any advice or references. .
Judy, the only thing I don’t like about a tumbler is that in cold weather the breakdown of materials in the tumbler nearly stop. When the temp is around 35 degrees F it just stops breaking down. In the summer you can make compost is 2-3 weeks if you rotate the tumbler about 6-7 compete revolutions every 24 hours. That has been my experience. When building the compost pile on the ground it retains some heat. It slows but still works. I too have wondered about the kitchen scraps stored in a 5 gal. bucket spoiling. I put my scraps in the blender with some water and chop them before storing in a bucket. My stored scraps do smell even though I never put in dairy or meat and they make the same fine compost as fresh scraps make. Maybe someone will get on here and tell us what they think about spoiled kitchen scraps. I have been composting spoiled kitchen scraps for years without a problem. I’ve never given thought to any potential problems of this, assuming it is just a head start on the composting process. But so far so good and I figure if it was a problem, I would have known by now. I have a small wood burning fireplace, I usually throw the ashes into the compost bin, but now I want to buy some worms and try that technique. Will the ashes kill the worms? And how early in the season should I buy worms and throw them into the bin? I don’t want them to freeze before they can work their magic. I live in Michigan. The ashes won’t kill the worms but too much of that is not good either. They will move away from what they don’t like. So use in moderation and find somewhere else to put most of your ashes. they can alter the pH and raise it above the ideal range. If you want to add worms, you can do that about now if your compost pile is large enough. the worms will move to the warmest part of the heap which if actively composting, should be a good bit warmer. Winter is the time where the heaps are least active but now that we are in spring, you should be able to do that safely. If you want to play it completely safe, wait until you are past your frost fee date. I’m assuming that’s around mid-May for Michigan. When you compost you said to put cardboard from pizza boxes and paper rolls. Can you put regular big cardboard boxes in the compost pile. My husband thinks they could be put in there also, but you didn’t mention them. Thank You you have a great show. You can put large cardboard into your compost as it will eventually breakdown. Water will help that happen faster. But no matter what, the smaller the size going into your compost, the faster it will break down. That’s true with anything you put there. So if you have the time, break the boxes down and separate them into pieces…the smaller the better. I was just introduced to this site and so far so good. i love it. I am always looking for better ways to reduce and reuse. Hi. This is a question. As of today, I have decided to start composting. Yes, I should have done this years ago, but here we are, as low as we can get financially due to the economy, and I really want to do this. As we have no extra money, can I use a rubbermaid container that I used to store clothes in and should my only expense be worms? I cook so much, I just got tired of throwing all my kitchen waste away. Also, at this time, we don’t have much yard waste (my dogs took care of that). Is yard waste necessary for composting? And your ‘from around the house list’, does that stuff get put with the kitchen waste? Hi Michele. Glad to hear you are putting your kitchen scaps to good use. And from around the house, add the paper towel and toilet paper rolls, and shredded paper. Don’t worry about not having yard waste. From your message it sounds like you’re going to create a worm bin and harvest their composted castings. Very good choice. And as for your question about the only expense being worms, I’d say yes to that. good luck!